In the sixth and final installment of our podcast series examining the state of the reproductive health, rights, and justice movement in the United States on the occasion of the 40th anniversary of Roe v. Wade, we speak with Lynn Paltrow, the executive director of the National Advocates for Pregnant Women. Ms. Paltrow discusses the implications of the Supreme Court’s decision in Roe v. Wade, not only for women who choose to terminate their pregnancies but also for those who choose to carry to term. Jessica Arons: Thank you for joining us today. My name is Jessica Arons. I’m the Director of the Women’s Health and Rights Program at the Center for American Progress. And I’m joined today by Lynn Paltrow, who is the executive director of National Advocates for Pregnant Women—and a brilliant legal mind, if I may say so. I’ve asked Lynn to talk with us today about the rights of pregnant women and how that has been impacted by the landmark [Roe. v. Wade] Supreme Court decision. Roe greatly expanded reproductive freedom by recognizing the right to abortion, but you’ve pointed out in your work that it’s also been used, or some might say misused, to harm the rights of women who carried their pregnancies to term. So, can you explain that for us? Lynn Paltrow: Well, I wanted to start just by making a little bit of a historical comparison. I think when Brown v. Board of Education was decided, saying that segregation in schools, “separate [but] equal,” was not constitutional, it was understood as a validation and a victory for the personhood, the humanity, the equality for African Americans in the United States. But as we’ve seen, really things remain quite segregated in schools, quite unequal in terms of economic issues. In Roe v. Wade, by contrast, it was a decision that was not understood as an affirmation of the rights of women or their personhood and humanity, even once they become pregnant. But the interesting thing is that almost immediately the public health situation for pregnant women changed. [It] went from something like estimates of—I don’t know—75 to, you know, hundreds of thousands of women getting sick and dying each year from illegal abortions to, almost overnight, that public health problem disappeared. So, it was an amazing decision for pregnant women. And each year 1 million women have abortions; 1 million women, almost, experience pregnancy losses, stillbirths, and miscarriages; and 4 million women continue their pregnancies to term. And I believe each and every one of them has benefited from Roe v. Wade. And as the Supreme Court said itself, Roe v. Wade not only protects a woman’s right to terminate her pregnancy but has also been sensibly relied upon to counter attempts to interfere with a woman’s decision to become pregnant and go to term. The principles of Roe should protect every pregnant woman. But in the years since Roe, there have been numerous antiabortion measures and so-called pro-life measures. And those have been used to deprive all pregnant women of what we would call their personhood. So, despite the fact that Roe is still the law of the land, we have identified cases where women have been arrested for having abortions. We had a case where a woman was kept in jail to prevent her from having an abortion. We have cases where women who go to term and give birth to healthy babies are being arrested based on the claim, the misstatement of Roe, that after viability, somehow what Roe really said was that fetuses are persons, which is the opposite of what it says. But because of this culture and political environment, judges in emergency situations, very urgent situations, believe that. So, women have been forced to have unnecessary Caesarian surgery, tied down, locked up, based on the claim that an existing law such as a feticide statute—an antiabortion measure that declares that the state wants to treat fertilized eggs, embryos, and fetuses as if they are already separate from the pregnant women—has been used to encourage and cited as the authority for depriving pregnant women of their physical liberty, as well as pretty much everything else we associate with constitutional personhood. JA: Are women losing constitutional rights when they become pregnant? LP: Well, I think that that’s the conversation I’d like to see us having. Both sides of the very divisive abortion debate have been complicit in the notion that all that’s at stake is the issue of abortion. That if so-called personhood measures pass, the only thing that’s at stake is the question of abortion, or maybe reproductive rights a little more broadly. We’ve done a study that looked at cases involving the arrests, detentions, and interventions on pregnant women. And what we see is that in the guise of just trying to overturn Roe or recriminalize abortion, what’s actually being put into place is the basis for depriving women, from the moment they become pregnant, of their constitutional personhood. And so the question isn’t, “Are you for or against abortion?” The question is, “Are we going to have essentially a new ‘Jane Crow’ system of law in which, upon becoming pregnant, women belong to a separate unique category of persons that can be deprived of almost every constitutional right, including the right to life?” And I say that having represented the family of Angela Carder, who was forced in the name of separate rights for fetuses to undergo Caesarian surgery even though the court understood it might result in her death. And, in fact, they forced her to have that surgery, and it, in fact, contributed to her death. And it deprived her of her right to life. JA: Whenever I think about the Carder case, it just points the direction for more work. I’m glad you mentioned Jane Crow. Because I know from your work that there are racial aspects to the deprivation of rights of pregnant women as well. Can you talk a little bit about the racial implications and disparities? LP: Well, we’ve known for a long time that arrests, detentions, and forced interventions on pregnant women have been grossly disproportionately applied to low-income women and African American women. Authors such as Dorothy Roberts, scholars such as April Cherry have written quite eloquently and brilliantly about how these issues reflect the profound and deep racism in this country and how from all the way back to slavery, a tradition often enforced through the law, of not valuing black motherhood in particular. And in our study, we saw that consistently, that sad history of ongoing racism played out—where we saw that African American women were disproportionately targeted for these punitive interventions; that they were more likely to happen in southern states; that African American women were more likely to be charged with felonies and more likely to be reported to state authorities by health care workers. Our data did show that these cases have actually happened in every region of the country and to women of all races. But the idea of inequality is fundamentally rooted in Americans’ history of slavery. So, you can’t fix these problems for all women unless we address the underlying history of racism, the ongoing racism that allows these things to happen to any woman. And then, as I think Michelle Alexander so brilliantly points out, that then apply to everybody. JA: What are the arguments that you would make on behalf of women’s reproductive freedom if we didn’t have Roe or we weren’t afraid of losing Roe? LP: My answer wouldn’t be limited to reproductive freedom. We have to focus on a broader question, and that question is: “Is there a point in pregnancy when women lose their civil rights?” Because the decisions that seem to be just about abortion are really about all women who may or may not become pregnant over the course of their lives. Ninety-four percent of all women in the United States become pregnant and give birth by the time they are in their 40s. That’s a huge demographic that has to be part of this discussion. And an interesting point of comparison in the Angela Carder case, a case in which a woman was told that in the name of separate rights for fetuses she could be required to sacrifice her life—and, by the way, neither she nor the baby survived—we don’t require anybody to undergo surgery for the benefit of another person about whom we have no question of their legal status. And I was talking at a law school in Maryland once and there was somebody who kept defending the fact that Angela Carder was forced to undergo this surgery. And I finally said to him, “Well why is it that pregnant women can be required to do that and be treated separately and unequally from other people?” And he paused and he said, “It’s just the burden women bear.” It’s just the burden pregnant women bear. So, the application of that principle doesn’t stay limited to abortion. In Laura Pemberton’s case, she was trying to avoid unnecessary Cesarean surgery. She was in labor at home. They sent a sheriff to her house. They strapped her legs together, put her in an ambulance, and brought her to a hospital, where without any due process, they decided for her that she should have this surgery. And the argument for why she could be subjected to major surgery, deprived of her physical liberties, deprived of her bodily integrity, deprived of due process, was the same argument [being] used to overturn Roe to make abortions illegal—that the fetus inside of her should be treated as a separate legal person and the state should be authorized to act in any way it thinks best for that fetus. So, we see that these things are all connected. We have to confront the question of “Are we going to say that women are full persons under the Constitution or not?” And that should be the only question. JA: Thank you so much for your time today, and thank you for all that you do to protect the rights of pregnant women. 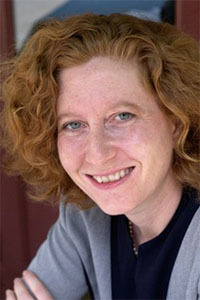 Jessica Arons is the Director of the Women’s Health and Rights Program at the Center for American Progress.